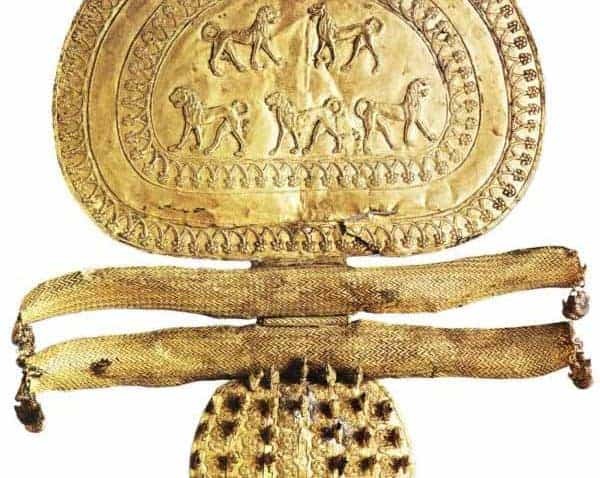 The Etruscans were a civilized society living in Italy during the Bronze and Iron ages. Their city states were located in Etruria, a region in central Italy that was bordered in the south near modern day Rome and eventually expanded as far north as modern day Milan. 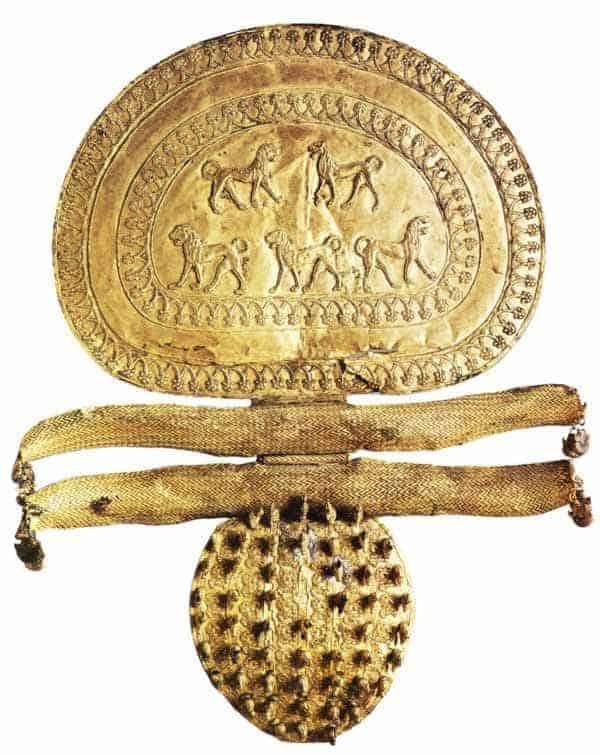 The Etruscan people were contemporaries of the Greeks and had a strong trading relationship with them. 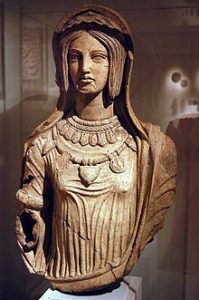 The Etruscan art and culture was eventually absorbed into what would become the predominant Italian culture, the rise of Rome. The artists and craftsmen of this culture are known for their gold work, painted terracotta panels, and figurative sculpture made from stone and from terracotta. The forested and pastoral region of Italy known as Etruria was settled, according to legend, by peoples from western Asia Minor. There is arguable evidence the story could be true as they share a similar language with the Aegeans. Other parts of Italy were colonized by the Phoenicians and the Greeks, and they had contact with the Villanovan culture who were the possible forerunners of the Etruscans in the same area. Scholars debate whether or not Villanovans and Etruscans are the same peoples. The governmental structure of Etruria was one of individual city states ruled by kings and confederated in unity of common language and religion. They were later ruled by nobles and then, through war and assimilation, eventually came to be ruled by Rome until their culture had mostly dissipated under Roman influence. The religion of the Ancient Etruscans was ominous and hostile and centered on servitude to angry gods in hopes of being spared misfortune. This belief system influenced the art that has been found in excavated cemeteries. Whether or not all Etruscan art was religiously influenced cannot be determined as most of what has been discovered has been from these types of excavations. Etruscan pottery and sculpture were highly influenced by the Greeks, especially in painted pottery and other wares. The most notable pottery is known as Bucchero and was shaped and painted in a style that emulated metal with a shiny black surface. 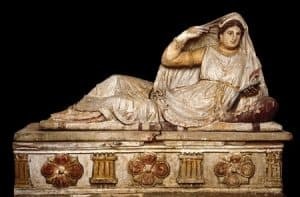 They also created sculpture in free standing terracotta forms, architectural relief, and sculpted very individualized sarcophagi that were often topped with a nearly to scale figure of the deceased and carved reliefs on the sides. Funerary urns included a lid that also featured the deceased, usually banqueting, and the sides were decorated by relief or stone carvings. Inferior terracotta urns were massed produced and these showed generic scenes that were influenced by Grecian themes. Etruscan painting technique was characterized by painting directly on fresh plaster so that the paint adhered to the plaster and thusly became part of the wall itself. Many surviving paintings are those on wall frescoes at burial sites. Later techniques included those such as chiaroscuro, which gives greater depth and value. 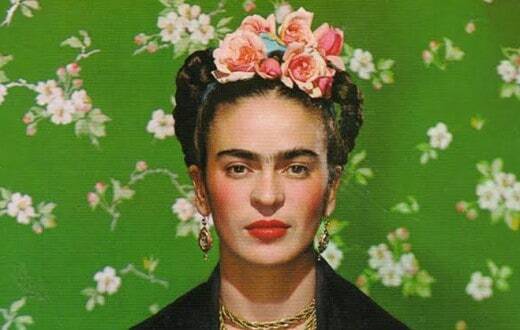 Subjects included scenes of daily life, religious, and mythological themes. 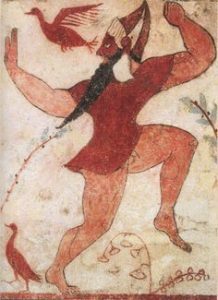 Wealthier Etruscans were able to afford frescoes painted on their villa walls that were more joyful than those at burial sites, for obvious reasons. They depicted healthy dancing or celebratory individuals or couples full of vitality and happiness. The Etruscans did leave behind over 13,000 texts, and scholars are still working on deciphering. Of note are texts that were created on thin sheets of gold and those that are inscriptions on monuments. The Etruscan alphabet was influential in the creation of the Latin alphabet which is the precursor to our own. The word “person” in English is derived from a mythological masked Etruscan figure, Phersu, who played a game of blood-letting with a victim to appease the deceased, and this “game” was what later became the gladiator games of the Romans. Some funerary urns were in the form of “huts” that were meant to house the dead. These urns give scholars an idea of what actual Iron Age Etruscan dwellings would have looked like. As Etruria became wealthier, the burial sites became elaborate with tombs that were nearly entire houses themselves, and were decorated with great opulence. Many cultures have included objects in graves to help the dead continue in the afterlife, but the Etruscans did so on a grand scale that in one case included a full size bronze bed and carriage. The Romans were so greatly influenced by the Etruscans and respected their knowledge so much that for many hundreds of years the Romans kept an Etruscan priesthood going that they would consult for advice on how to battle barbarians. The Etruscans were the first city planners to lay out cities in a grid pattern.